Cairns has some of Australia's best fishing right on it's doorstep. Species such as Spanish Mackeral, Giant Trevally, Queenfish and Barramundi can all be caught by anglers of all experience levels. Half or full Day River/Estuary tours are very popular, with Barramundi the main target. Reef fishing for arguably Australia's best table fish - the Coral Trout, is another popular option. 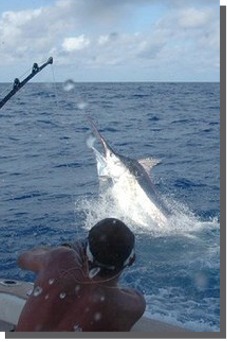 Between September and December anglers from all over the world flock to Cairns for it's renowned Black Marlin fishing. These game fishing boats also offer light and medium tackle options throughout the rest of the year. A private charter is also a very popular Cairns fishing option. Unfortunately due to safety concerns fishing and snorkelling/scuba diving in the one day from the same boat is not available except on a private charter. Fancy some fish for dinner? Then try your luck with Aqua Cat. Reef fishing for beginners & experienced fishermen, departing daily. Ex Port Douglas. Full day reef fishing for all the family. Rods or Handlines - all tackle and bait supplied.